It is indicative of the nature of Roman civilization that this catalogue of Roman coins should include this coin, the denomination and language of which are not Roman. Issued by Mark Antony in partnership with Cleopatra VII, this tetradrachm speaks of her wide-ranging and daring plan to create a new Egyptian empire in the East, aided by the power of Rome. The greatest risk of the undertaking was that control within Rome was being contested and Cleopatra needed to choose the winning side in order to succeed—and survive. The creation of the triumvirate of Mark Antony, Octavian Caesar, and Lepidus in 43 B.C. transformed the nature of the Roman Republic, but it was not yet clear how—or from where—the new Rome would be ruled. The “Liberators” Brutus and Cassius, the assassins of Julius Caesar, had established themselves in Rome’s eastern provinces, but they did not manage to get the backing of Egypt’s ruler (and Julius Caesar’s lover), Cleopatra VII. The triumvirate’s first order of business was thus to recover the East and keep the wealth of Egypt within reach of Rome, while Cleopatra needed to dexterously manage the interests of Rome in order to keep her siblings and other potential rivals at bay and to secure the independent future of Egypt. As relations with Octavian deteriorated and his own military efforts remained underwhelming, Antony was desperate for money and ships. In 37 B.C., though not yet divorced from Octavia, he and Cleopatra wed in a union recognized in Greek lands but not in Rome. A costly and inconclusive military campaign in Parthia was followed by a modest victory in Armenia, which Cleopatra and Antony celebrated in 34 B.C. as a “triumph” in Alexandria. During this victory celebration—an imitation of the Roman triumphs, which were the prerogative of the Senate to bestow—Antony, Cleopatra, and Cleopatra’s four children dressed as Hellenistic Egyptian deities. Antony had already been hailed in Athens as the New Dionysos, and he reprised the role here, assimilated to Osiris. Cleopatra assumed her traditional role of Isis, and their twins, Alexander Helios and Cleopatra Selene, appeared as the Sun and the Moon. Their youngest son, Ptolemy Philadelphus, just two years old, was dressed as one of the Diadochoi, the successors of Alexander, according to Plutarch.2 Cleopatra’s eldest son, Ptolemy Caesar, called Caesarion, was promoted as the son and rightful heir of Julius Caesar. Here the clear implication was that Antony’s rival Octavian, the posthumously adopted son of Julius Caesar, was an impious usurper, and that the wealth and political capital he claimed to inherit justly belonged to Caesarion, Julius Caesar’s natural son. Antony in this way could pose as the real protector of Caesarion, surely hoping to curry favor with Romans. As Roman consul and triumvir, Antony then declared Cleopatra to be Queen of Kings of the eastern regions and her children Kings of Kings.3 This, in contrast, was not going to enchant the Romans, but Antony needed Cleopatra. In this Donation of Alexandria, Antony claimed to restore Ptolemaic rule over large parts of former Roman provinces, from Cyrene to Parthia and Armenia, as well as some neighboring kingdoms. Antony’s authority to so bestow these lands was rather shaky. Underscoring the weakness of his situation is the fact that although he was the consort of the queen and the father of three of her children, Antony did not enjoy an official position in the Donation or elsewhere in the power structure Cleopatra foresaw for Egypt. The Donation of Alexandria was a great shock to Rome, and shortly afterward, in 32 B.C., the public scandal of Antony’s divorce from the long-suffering Octavia lost Antony the rest of Rome’s dwindling support.4 Back in Rome, Octavian read Antony’s purported will in the Senate, letting it be known to the public that Antony was willing to allow himself, and Rome, be ruled by a woman—and a foreign woman at that.5 This final breach between the two former allies led to the battle of Actium the following year, the deaths of Antony and Cleopatra, and the gradual creation of the principate. Though the Republic was not officially pronounced dead (indeed, Octavian would claim to restore the Republic), from this point on Rome would essentially be ruled not by an elected senate but by a prince (princeps, chief). For Cleopatra and Egypt, it meant the end of more than 350 years of Ptolemaic rule, as well as the end of her brilliant and storied life. A particular fascination of this coin lies in the way that it reflects the complex manipulations and redefinitions of cultural and political identity during these years. It is useful to compare this tetradrachm to other coins minted by Antony and his rivals at this time. Double-headed types had appeared recently in some issues (denarii and tetradrachms) of the triumvirs and others who thought they might have a chance at ruling Rome. These two-headed coins articulated political and cultural associations as well as dynastic relationships of the individuals depicted on the coins.8 An earlier tetradrachm of Antony and his wife Octavia from Ephesus (possibly), included in this catalogue,9 shows how this worked: while the denomination (tetradrachm) and cultural referent (Dionysian Mysteries) are local and seem to celebrate Rome’s appreciation of the culture and religion of the Hellenistic East, the coin also trumpeted Antony’s collaboration with Octavian (sealed by his marriage to Octavian’s sister) and announced Antony’s official Roman titles in Latin (in the nominative case, as is usual on Roman coins). Curiously, the coin is minted backward by local standards: on civic tetradrachms of the Hellenistic East, the issuing authority should appear on the reverse of the coin. But Antony’s portrait is here on the obverse, and Octavia’s on the reverse. Certainly Octavia did not issue this coin: perhaps the layout reflects Roman cultural norms of male dominance and the perceived reality of Rome’s political and military dominance over the East. At any rate, the authority of Rome is strongly in evidence. The Greek inscriptions on the coin seem straightforward enough, but only add to the ambiguity. To begin with, they reflect a curious creeping of Roman coin production habits. Though the inscriptions on both sides are in Greek, they are both in the nominative case, simply naming the individuals represented on the coin, and they are written around the periphery of the coin. This is typical of Roman coins.13 Hellenistic coinage was inscribed in the genitive case, proclaiming the coin to be, for example, “of Queen Cleopatra,” and the inscriptions were usually written across the coin either horizontally or vertically or both. The use of Roman-style inscriptions (though Greek in language and script) on both sides of this coin suggests the extent to which it reflects a hybridization of Hellenistic and Roman culture, at least at the numismatic level.14 But is this a thoughtless combination of styles, or is there a reason for the odd choice? On the reverse we find ANTωNIOC (Antonios) AYTOKPATωP TPITON (autocrator triton, imperator for the third time) TPIωN ANΔPωN (trion andron, triumvir).15 The titles, though in Greek, are traditionally Roman, bestowed by the Senate, and constitute the authority by which he could mint coins. There is no mention of any royal claims or local honorifics, such as identification as the New Dionysos, an honor given to Antony in Athens and Ephesus. The inscription, however, is in the nominative case, as is typical of Roman coins, instead of in the genitive, which would recognize the authority issuing a Greek coin. The effect of this is that Antony is simply identified here, rather than identified as the actual issuing authority—a subtlety that may or may not have been lost on all but the mint officials involved. The unobjectionable titles are accompanied by a modest lack of any visual claims of power, such as laurel or oak wreaths. The obverse is even more cryptic: BACIΛICCA KΛEOΠATPA ΘEA NEωTEPA. This could be read as identifying Queen (Basilissa) Cleopatra as the “younger goddess” (Thea Neotera), though exactly to whom this cult might refer is unclear. Cleopatra’s long-established identification with the goddess Isis was already strong and politically useful, so any benefits of an identification with an unnamed goddess are equally mysterious. More likely, the title is evidence that the queen of Egypt was engineering a careful reinvention of herself as the new incarnation of her ancestress Cleopatra Thea, who as wife of three Seleucid kings became the Ptolemaic queen of Syria from 125 to 121 B.C. This interpretation is reinforced by the fact that other coins of Cleopatra in Syria and Phoenicia that indicate the year of issue use a different dating system from that used in Egypt: this dating era begins with Antony’s grant of Syrian lands to Cleopatra in 37 B.C. Together, this evidence points to Cleopatra’s aims to combine the dynastic claims of two successors of Alexander the Great—Ptolemy and Seleucus—and to renew the Egyptian Empire.16 In contradistinction to Antony’s portrait, Cleopatra is not depicted bareheaded. She wears the royal diadem, as worn by the successors of Alexander the Great. Antony may have had the authority to mint this coin, but the power and the wealth were Cleopatra’s. This coin seems to telegraph the realpolitik of the situation. 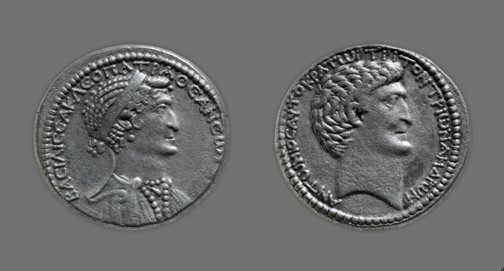 Cleopatra’s portraits on her coins (or coins minted for her, such as this one) show different views of the queen, just as Antony’s portraits vary over time and from region to region. While sculptures identified as Cleopatra seem generally to reflect either a hieratic Egyptian or a Hellenistic, idealized image, the coin images seem to show almost a different woman (see fig. 22.1). On this coin, her strongly aquiline nose, powerful neck, and heavy brow signal a nearly masculine power and seriousness, while the elaborate, bejeweled garment she wears and the pendant pearl earring announce her royal magnificence. It is natural to want to know which image is more “real,” the softer Hellenized images or this coin portrait with its apparently exaggerated features. As with the sculpted portraits, and for much the same reasons, the question is not simple. On this coin, the striking similarity of the obverse and reverse portraits may present a clue. Antony’s portrait resembles other images of him just enough to be recognizable, just as Cleopatra’s differs from other images of her, while at the same time the two portraits have grown remarkably similar to each other. The visual assimilation of members of a ruling family to each other is a common enough phenomenon, a way to emphasize their harmony, strength, or legitimacy (see, for example, cat. 24, Solidus (Coin) Portraying Emperor Constantine I). The question here is who is being assimilated to whom. Arguments have been made for Cleopatra’s portrait’s being modeled on that of her father, Ptolemy XII Auletes, though again his own public portraits may have been influenced by Roman examples.20 More convincing on visual and political grounds is the similarity of her portrait to that of Arsinoë II, daughter of Ptolemy I and wife of her own brother, Ptolemy II—and indeed, similarity to their portraits as well (see fig. 22.2 and fig. 22.3). 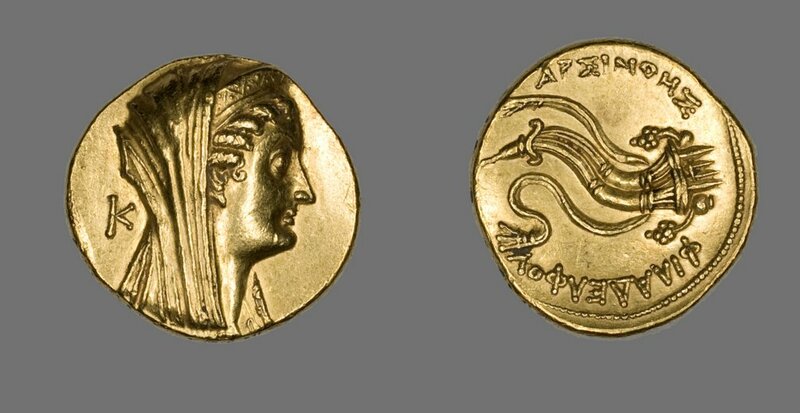 Cleopatra did, on occasion, adopt the double uraeus crown and double cornucopia characteristic of her ancestor Arsinoë, so we know she identified herself with that great queen.21 The Ptolemy family resemblance is pronounced, and on this coin not only Cleopatra but her consort Antony “sport [the] splendidly beaked noses and protruding chins”22 so familiar from the faces of her ancestors, the craggy-visaged Macedonian founders of the dynasty and the empire Cleopatra wished to revive. Sacrificing vanity for power, Cleopatra clearly did not care whether she looked beautiful on the coins (whatever that meant in her world), or even if she looked much like herself. A notable resemblance to her ancestors who ruled the vast eastern lands she now claimed, through the Donation of Alexandria, was more useful. 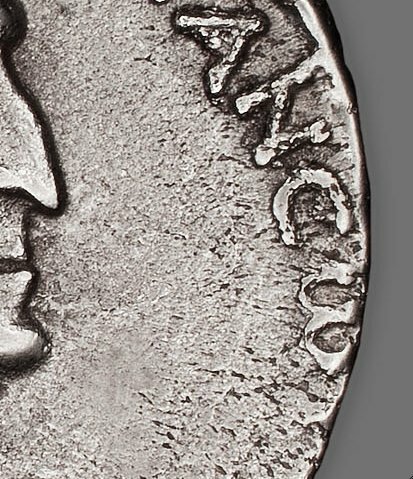 Antony too, as imperator over the region and thus the issuing authority, would have had a say in the depiction of his profile; his likeness is more recognizable on other coinage (such as cat. 31, Denarius (Coin) Portraying Mark Antony) and presumably he acquiesced to this image. Here his artificial resemblance to Cleopatra (and thus to the Ptolemies) is baldly manifest. He must have deemed it politically expedient. Since his position within the Ptolemaic dynasty was so new and unfamiliar, this was a way to visually integrate himself into the royal family in the consciousness of the Syrians.23 After all, he was no longer merely a triumvir and commander of the Roman armies in the East—he had gambled his future on Egypt and Cleopatra. This coin is made of silver alloyed with a small amount of copper. Additional impurities of lead and gold are also present. The coin was struck with a free-floating reverse, resulting in a die axis of 1:00. Although the coin shows a clear strike, a number of surface features provide clues that the dies used to make the coin—particularly the obverse—had become somewhat worn by the time of striking. The coin is in good condition overall but displays a pitted, veined texture suggesting either that the flan (or blank) was at a relatively low temperature during striking or that the coin was subject to surface enrichment or an overly aggressive cleaning. Minor casting flaws are visible on both the obverse and the reverse faces, and a moderate degree of age-related wear can be seen, particularly on the obverse. During its time in the museum’s collection, the coin has received only one documented treatment. Metal dies were used to impress an image onto the flan. Few ancient official dies survive today: when a die reached the end of its useful life, because of wear or the discontinuation of the design, it was typically destroyed to prevent unauthorized use. Nonetheless, enough evidence remains to conclude that the dies were usually made of a bronze alloy containing a relatively high percentage of tin that could be made sufficiently hard to strike even bronze coins.37 The vast majority of images on ancient coins are in relief. This means that the images on the dies were carved in intaglio, as a negative image below the metal surface of the die, similar to the way stone seals were cut or engraved, giving a mirror image of what would be displayed on the coin. Also as with stone engraving, the tools were made of iron and would have included punches, burins, chisels, and drills. Two dies were usually employed in striking a coin. The obverse (lower) die was fixed in position, usually into an anvil or a block of wood. The reverse (upper) die was loose; the image could be engraved directly into the base of a cylindrical or pyramidal piece of metal or, more commonly, into a bronze disk that was fitted into an iron punch or collar. The obverse die was used to stamp the more important side of the coin, which often displayed deeper or more intricate images. Its protected position in the anvil gave a better chance of a clean impression. The life-span of a die depended on a number of factors: the composition of the metal, the size of the die, the depth of the relief, and the number of coins made. The obverse die wore down less quickly than the reverse die, which was struck repeatedly with a hammer.38 Dies were sometimes recut or altered for the purpose of changing the inscriptions but also to make repairs to cracks or flaws. To strike a coin, the minter would put a hot flan (either just cast or reheated) on the lower die, place the upper die above it, and strike the upper die with a hammer, transferring both designs onto the softened metal.39 A single strike was usually sufficient, but minters sometimes used two strikes. Occasionally a coin will show evidence of multiple strikes in the form of a double or “ghost” image. This is the result of the coin shifting between strikes or the die vibrating out of position. The coin shows a very good strike, and overall the rendering is extremely distinct. The top of Mark Antony’s hair and his profile are well demarcated and appear in deep relief. The inscription on the reverse is also remarkably clear, with the exception of the final few letters in the bottom proper left quadrant (fig. 22.4). The obverse die exhibits a certain amount of wear, as evidenced by the lack of articulation in Cleopatra’s garment and jewels (fig. 22.5). There is a gradual loss of relief toward one edge of the coin that could be related to the angle of the mallet and the subsequent dispersion of force throughout the flan during striking. There is a crack on the outside edge that emanates from a small notch located between 9:00 and 10:00 when looking at the obverse face. This crack is the result of mechanical stresses in the microstructure brought on by rapid cooling of the flan after striking. No mint mark is present on this coin. 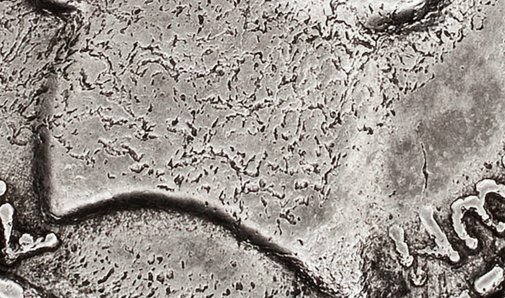 On the reverse, several “islands” of smooth metal can be seen within the veined, pitted metal, in particular between the bridge of the nose and the inscription in the top proper left quadrant (fig. 22.10). This difference in surface texture is likely a secondary effect of whatever caused the pitted surface. There is a large pit in the smooth area in the top proper left quadrant. Areas of high relief at the center of both portraits exhibit some degree of use-related wear. Numismatica Ars Classica AG, Zurich, Greek, Roman, and Byzantine Coins, sale cat. (Numismatica Ars Classica AG, Apr. 29, 1998), p. 34, lot 335, pl. 26, no. 335. 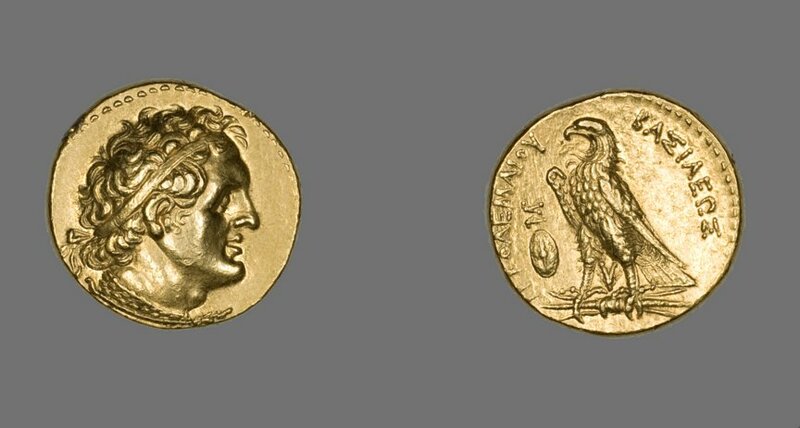 Mary Greuel, “Coin with Portraits of Cleopatra and Mark Antony,” in “Notable Acquisitions at the Art Institute of Chicago,” special issue, Art Institute of Chicago Museum Studies 35, 2 (2009), pp. 34–35 (ill.). Art Institute of Chicago, “From the Collection,” Member Magazine: Art Institute of Chicago (Mar.–Apr. 2009), p. 29 (ill.). Karen Manchester, ed., Recasting the Past: Collecting and Presenting Antiquities at the Art Institute of Chicago (Art Institute of Chicago, 2012), pp. 74–75, cat. 14 (ill.); 111. Elizabeth Hahn Benge, “From Aegina to Andronicus: A Survey of Coinage at the Art Institute of Chicago,” Historia mundi: Le medaglie raccontano la storia, l’arte, la cultura dell’uomo 5 (Jan. 2016), pp. 206 (ill.); 207, fig. 10; 209–10. 1) For Antony’s career during this period, see cat. 33, Cistophoric Tetradrachm (Coin) Portraying Mark Antony. 2) Plutarch (A.D. 46–119), Life of Antony 54.3–6, 55.1. 3) Plutarch, Life of Antony 54.4–5; according to Dio Cassius (A.D. c. 164–235), Antony only gave the title of King of Kings to Caesarion: Roman History 49.41. Dio Cassius was writing years after Plutarch. See also Huzar, “Mark Antony,” p. 108. 4) For other aspects of Antony’s career and coinage, see cat. 31, Denarius (Coin) Portraying Mark Antony, and cat. 33, Cistophoric Tetradrachm (Coin) Portraying Mark Antony. 5) Antony’s will left everything to Cleopatra and her children, much as Julius Caesar’s had left wealth and connections to Octavian. He also expressed the wish to be buried in Egypt with Cleopatra, a slight to the patria that Romans found distressing. 6) Williams, “Imperial Style and the Coins of Cleopatra and Mark Antony,” pp. 87–88. Exactly how Roman and local coinages interacted and overlapped is incompletely understood: see, for example, the otherwise essentially positive review: Howgego, Review of RPC I; Butcher, Coinage in Roman Syria, pp. 1–7. 8) Williams, “Imperial Style and the Coins of Cleopatra and Mark Antony,” p. 89. 9) See cat. 33, Cistophoric Tetradrachm (Coin) Portraying Mark Antony. 10) Williams, “Imperial Style and the Coins of Cleopatra and Mark Antony,” p. 87. 11) Eleanor Huzar notes that Cleopatra is the first non-Roman (real) woman ever to appear on Roman coinage; Huzar, “Mark Antony,” p. 108. 12) See the related discussion in Williams, “Republican Identity of Roman Imperial Coinage,” esp. pp. 69–71. 13) Though the dative case was sometimes used on Roman coins; see cat. 47, Denarius (Coin) Portraying Emperor Trajan. 14) Williams, “Imperial Style and the Coins of Cleopatra and Mark Antony,” p. 90. 15) The triumvirate should have ended in 38 B.C., but the triumvirs extended it to 33 B.C. ; Antony continued to use the title even after that. 16) Bingen, Hellenistic Egypt, pp. 75–77. See also RPC I, p. 602; Lorber, “Coinage of the Ptolemies,” p. 229. The three Seleucid rulers whom she outlived were Alexander I Balas, Demetrius II Nicator, and Antiochus VII Sidetes. Cleopatra could also claim descent from Seleucus through Cleopatra Thea. The debate regarding this inscription is unresolved. T. V. Buttrey’s original argument is accepted by Burnett et al. in RPC I, but see the objections raised by Howgego, in his review of the latter: Buttrey, “THEA NEOTERA”; Howgego, Review of RPC I, p. 203. 19) For a thoughtful exploration of Cleopatra’s beauty in the context of constructions of her cultural, ethnic, or racial identity, see Shohat, “Disorienting Cleopatra,” esp. pp. 132–34. 20) Walker, “Cleopatra’s Images,” p. 145. 21) Ashton, “Identifying the Egyptian-Style Ptolemaic Queens,” p. 152. 22) Williams, “Imperial Style and the Coins of Cleopatra and Mark Antony,” p. 92. 23) Williams, “Imperial Style and the Coins of Cleopatra and Mark Antony,” p. 92. 24) Primary or bulk materials were identified nondestructively using X-ray fluorescence spectroscopy. These results are purely qualitative and represent only the coin’s surface. The significance of these limitations is discussed in para 21. For more detailed results and a description of the conditions used, see Pozzi, “Analytical Report,” May 23, 2013. 25) Secondary or trace materials were identified nondestructively using X-ray fluorescence spectroscopy. These results are purely qualitative and represent only the coin’s surface. The significance of these limitations is discussed in para. 21. For more detailed results and a description of the conditions used, see Pozzi, “Analytical Report,” May 23, 2013. 26) Much of the information in this section draws on Wickens, “Production of Ancient Coins,” pp. 8–10. For further reference, see Carson, Coins of the Roman Empire; Crawford, Roman Republican Coinage, vol. 2; Grierson, Numismatics; Kraay, Archaic and Classical Greek Coins; Mørkholm, Early Hellenistic Coinage. 27) “[F]inding evidence for the sources of the precious metal is extremely problematic. The trace elements gold, bismuth, and lead can sometimes be useful in discriminating between metal from different sources and, on occasion, may even allow discussion of potential ore types; but so many changes occur to the trace element concentrations during the smelting, refining, and subsequent recycling of metals that any attempt at attributing provenance on this basis alone is doomed to failure.” Ponting, “Substance of Coinage,” p. 25. 28) “Foreign coins came into the states’ treasuries in the normal course of trade. Some of these would be kept as ‘foreign reserves’ but many could be used to mint new coins.” Wickens, “Production of Ancient Coins,” p. 9. If the coins were of the correct weight, it was possible to restrike them, superimposing a new image over the old one. 29) Some aspects of coin production, such as the designs stamped on the coins, were controlled by the emperor himself. Wickens, “Production of Ancient Coins,” p. 9. 30) “The amount of silver (or gold) in coins provides important evidence for the study of the Roman economy, and the study of copper alloy coins provides evidence for numismatic history and broader aspects of economic history such as resource exploitation and technology transfer.” Ponting, “Substance of Coinage,” p. 13. “As well as being a good indication of the political and economical state of a country, analytical data of ancient coins—metal speciation and concentration, for example—can tell us much about the extent of chemical knowledge that existed at the time a coin was made. Early Roman coins, for example, contained up to 5 per cent oxygen. The only uncombined metals present in such coins were those which formed oxides that could be reduced by carbon below 1600°C. This was the hottest temperature achievable in ancient forced-draught charcoal furnaces. Later Roman coins contained no oxygen, indicating that they were using an improved reduction technique, whereby higher temperatures were obtainable.” Goodall, “Ancient Coins,” p. 166. 31) The character of a coin’s surface will most certainly have been altered by corrosion processes initiated in the burial environment; the present surface will therefore be entirely different from that of the newly minted coin. For instance, coins made of silver alloyed with copper are susceptible to surface enrichment, a term that describes the apparent concentration of silver on the surface of a coin from which the copper has preferentially eroded due to the difference in electrode potential between the two metals. In some cases, the surface of the coin blank itself could have been modified by treatments carried out at the mint before the coin was struck. Ancient metalsmiths sometimes used oxidizing or acid treatments to leach or strip the copper from the surface of alloys of gold or silver and copper, a process known as depletion gilding or silvering. 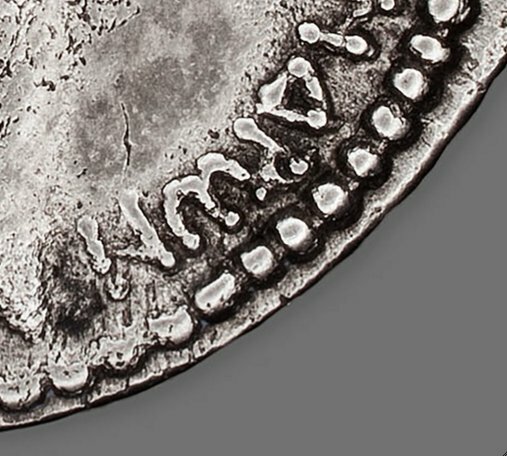 Furthermore, aggressive methods of conservation and restoration, generally no longer in favor, can also affect the nature of a coin’s surface. 32) X-ray fluorescence spectroscopy has gained considerable favor in the museum and numismatic communities because it permits easy collection of data by nondestructive means. The area actually being analyzed during XRF is extremely small, however: only a few millimeters in diameter and a few microns deep. Furthermore, for best results the surface being analyzed should be completely flat, which ancient coins, by definition, are not. This brings into question the representative nature of the analysis, particularly for silver alloys. For a comprehensive discussion of the advances and limitations of technical study with respect to numismatics, see Ponting, “Substance of Coinage,” pp. 12–30. See also Craddock, Scientific Investigation of Copies, pp. 178–85. 33) Struck coins, also called stamped coins, are classified as hammered coinage, to be differentiated from cast coinage, which is made by pouring molten metal into a mold, and milled coinage, which is produced in a machine. 35) “Flans of early coins tend to be spherical or lentoid in shape, and the coins made from them were often quite irregular, preserving the shape of the lentoid flan, flattened by the striking . . . In Hellenistic times flatter, disk-shaped flans were cast, and this continued to be the normal shape, at least for gold and silver coins. The result was thinner coins of a slightly larger diameter.” Wickens, “Production of Ancient Coins,” p. 10. 36) Remains of the runners connecting the flans can sometimes be seen on the outer margins of ancient coins. Wickens, “Production of Ancient Coins,” p. 10. Researchers with the Centre National de la Recherche Scientifique (CNRS) in France were unable to produce flans of a consistent weight using this method; see Collet and Faucher, Making a Mint. Scholars debate whether the metal was poured into molds or whether instead metal beads or granules of the correct weight were placed in a mold that was then heated in a furnace. Wickens, “Production of Ancient Coins,” p. 10. 37) This conclusion is based on evidence gleaned from the coins themselves, from analysis of the composition of medieval dies, and from modern experiments. Dies were also sometimes made from iron: examination of the marks left on some Syracusan coins has revealed that the dies used to strike them were rusty. Wickens, “Production of Ancient Coins,” p. 11. In recent experiments, CNRS researchers found that dies made from ferrous metals lasted longer than those made from bronze; see Collet and Faucher, Making a Mint. 38) “Smaller dies and dies with shallower relief lasted longer. Modern experiments suggest that an obverse die could strike about 15,000 acceptable coins, a reverse die only about half as many. Often, however, more than two reverses were used with an obverse die, since dies were often replaced before they wore out . . . Dies at smaller mints were often used for three to five years. In the busy mint of Hellenistic Athens, an obverse lasted for three to five months. And during some peak periods of minting in Roman times, a die might have lasted only 12 hours.” Wickens, “Production of Ancient Coins,” pp. 10, 11–12. See also Collet and Faucher, Making a Mint. 39) “In many cases one person could manage the whole striking process alone, first placing the flan on the lower die and then, holding the upper die in place with one hand, wielding the hammer with the other. In this way a modern experimenter was able to strike 100 coins an hour, including casting the blanks. Yet more often, especially in large mints, three or four people were involved. Using tongs, one person would bring the flan from the furnace, another person or possibly two would hold the punch in place by hand or with tongs, a third would wield the hammer, and a fourth would remove the struck coin. Evidence for this comes both from coins and Latin inscriptions that list the workers in the Roman mint. Some Roman coins were misstruck in ways that indicate not only that three or more people were involved but also that in some instances the rate of production was very rapid, perhaps as much as one coin every three seconds.” Wickens, “Production of Ancient Coins,” p. 12. See also Collet and Faucher, Making a Mint. 40) At the beginning of the inscription, the top of the B is missing. 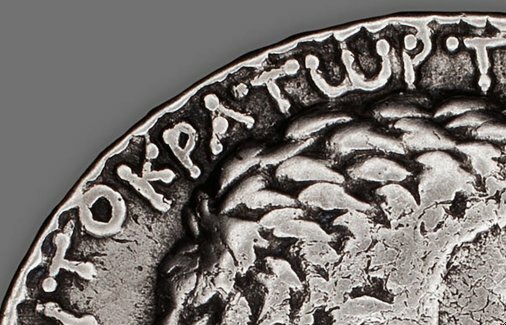 Originally the last word of the inscription would have been ΝΕωTEΡA; of the last four letters, all that appears on the coin is the bottom of the T.
42) Wickens, “Production of Ancient Coins,” p. 13. 43) The coin was measured three separate times using a digital caliper. Dimensions expressed are the average of the three measurements. 45) Examination of the microstructure of the metal would provide more information about the possible causes of this surface appearance. 46) Sabino, “Treatment Report,” July 10, 2013. 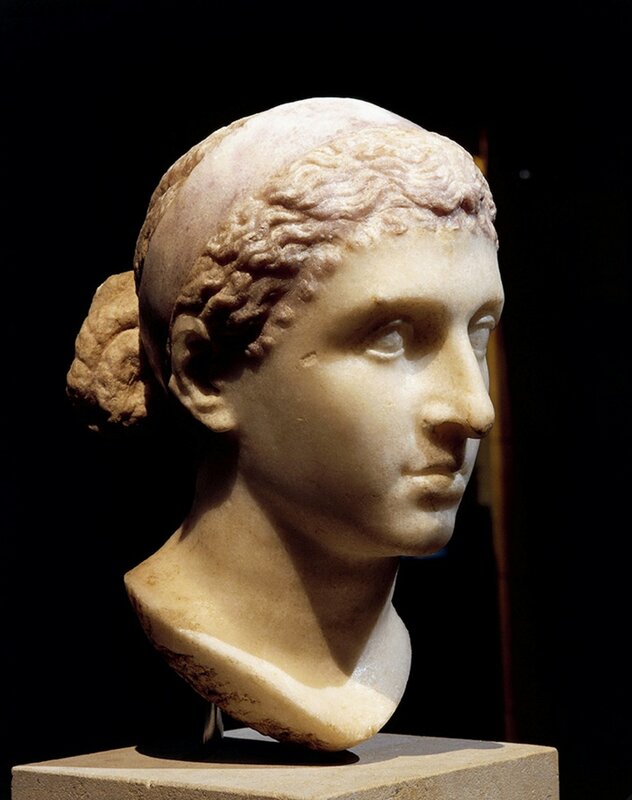 Portrait of Cleopatra VII, 50/30 B.C. Roman. Marble. Staatliche Museen zu Berlin, Antikensammlung. Octodrachm (Coin) Portraying Arsinoe II, 261 B.C. Greco-Egyptian. Gold; diam. 2.9 cm (1 1/8 in.). The Art Institute of Chicago, gift of Mrs. Frederick Robinson, 1933.795. Pentadrachm (Coin) Portraying King Ptolemy I Soter, 285–247 B.C. Greco-Egyptian, minted in Cyprus. Gold; diam. 2.4 cm (1 in.). The Art Institute of Chicago, gift of Martin Ryerson, 1922.4933. 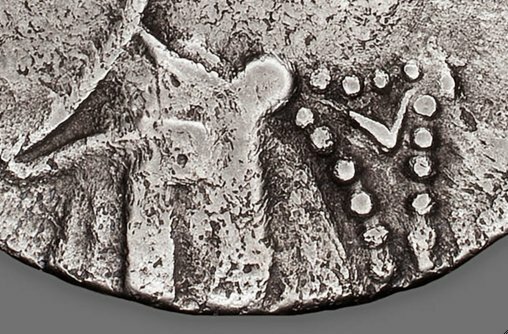 Detail showing the surface pitting on the reverse of Tetradrachm (Coin) Portraying Queen Cleopatra VII (37/33 B.C.). The Art Institute of Chicago, 2008.173. Detail showing the lack of articulation in the garment on the obverse of Tetradrachm (Coin) Portraying Queen Cleopatra VII (37/33 B.C.). The Art Institute of Chicago, 2008.173. Detail showing the indistinct final few letters of the inscription on the reverse of Tetradrachm (Coin) Portraying Queen Cleopatra VII (37/33 B.C.). The Art Institute of Chicago, 2008.173. 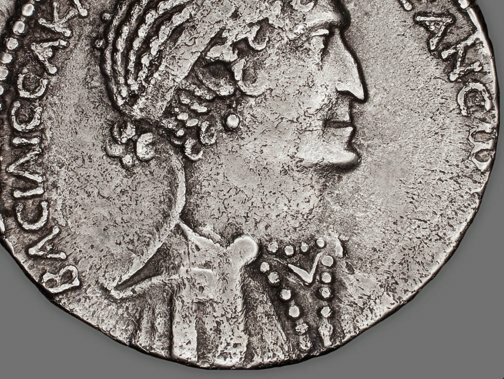 Detail showing the missing edge beading on the obverse of Tetradrachm (Coin) Portraying Queen Cleopatra VII (37/33 B.C.). The Art Institute of Chicago, 2008.173. Detail showing the missing edge beading on the reverse of Tetradrachm (Coin) Portraying Queen Cleopatra VII (37/33 B.C.). The Art Institute of Chicago, 2008.173. 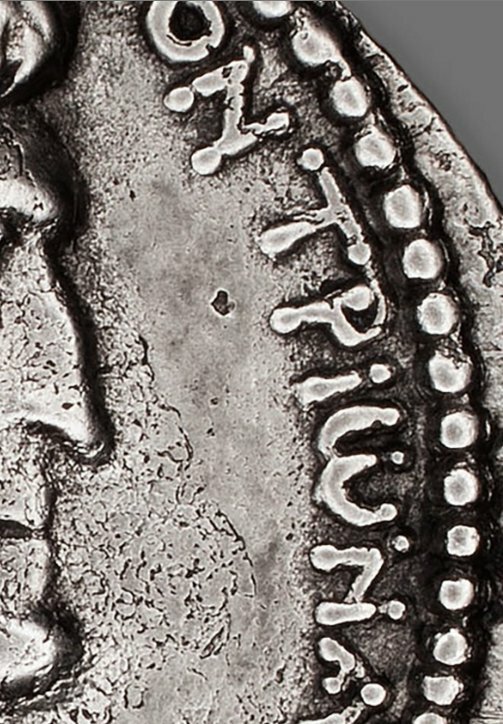 Detail showing the differing surface textures on the reverse of Tetradrachm (Coin) Portraying Queen Cleopatra VII (37/33 B.C.). The Art Institute of Chicago, 2008.173. Detail showing the truncated letters at the end of the inscription on the obverse of Tetradrachm (Coin) Portraying Queen Cleopatra VII (37/33 B.C.). The Art Institute of Chicago, 2008.173.